Update October: 3rd: Mel Hauschildt has been forced to withdraw an MRI confirmed a stress fracture of her sacrum. More details can be found on this post by firstoffthebike. Update September 29th: Victor Del Corral announced on his Facebook page that he has a stress fracture of is calcaneus and has said ‘bye bye’ to Kona 2015. Update September 17th: Corinne Abraham will also not be able to start in Kona after a string of problems including a September operation for an abscess and full-on antibiotics (details on her blog). 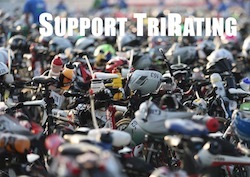 Update September 16th: Pete Jacobs announced on his blog that he won’t be able to start in Kona. Update September 4th: Ironman has announced both the names of the Pro athletes and their bib numbers. I have updated the post accordingly. I assume this also means that there will be no more roll down, any slots opening up by athletes not being able to race won’t be filled. Update September 1st: Laurel Wassner accepted a roll-down slot from Sonja Tajsich. After all Kona slots have been accepted, here is the preliminary start list for Kona 2015. There can still be some changes to the list – some athletes may get injured and decide not to start after all. There may be a few day in early September for a slot to roll down, but not closer to the race – that slot will just be gone then. I will update this list if any slots are declined or athletes announce that they won’t start. I provide a lot more details on the race and the participants in my free “Kona Rating Report” which you can already order at https://gum.co/Kona2015.